In the next couple months the large brown trout and rainbow trout will be moving to the upper portion of the water column. Some of the biggest fish of each year get caught by anglers trolling from 0-30′ of water during the late fall and winter months. A good way target these larger fish is to use a technique called rolling shad. This can be done with a double-hook rig, shad harness, bait threader, and many other ways. But, the key is to bend the shad so it will roll. Also, there are many ways to treat the frozen shad. It can be fished right out of the package. 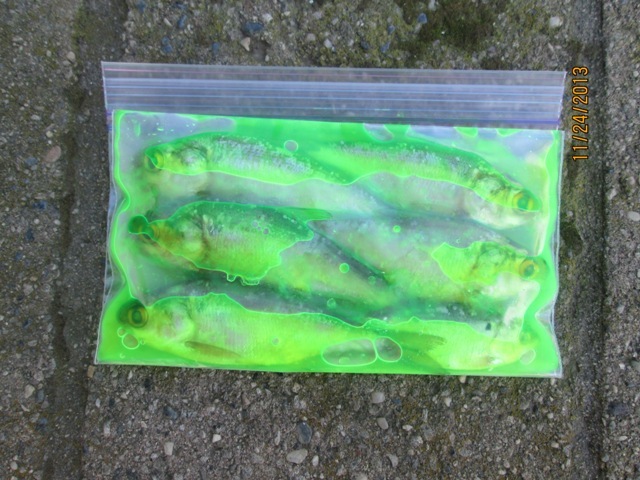 Or it can be put in shad brine, dyed and scented. The brine will cure the shad and make it last longer. 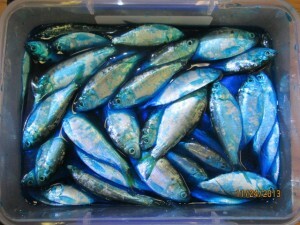 And, to help draw fish to the bait, try adding dye and scent. 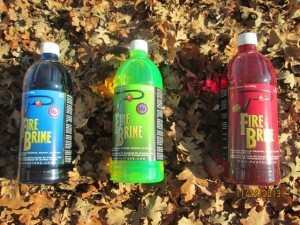 Pautzke Fire Brine: blue, chartreuse, and red. This is a great product that will brine and dye the bait. Just add scent if you would like. 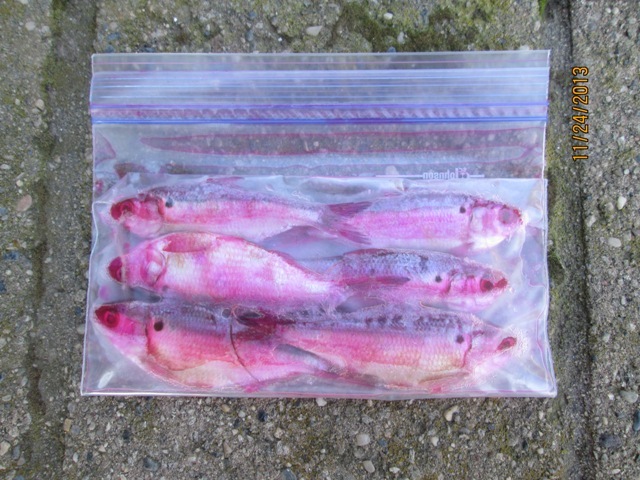 Simply place the shad in a plastic container or a plastic bag. Fill until the shad are completely covered and let them soak. 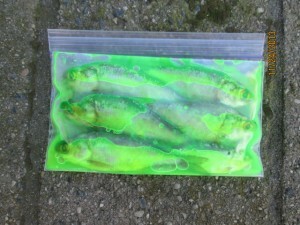 Chartreuse Fire Brine scented with Pro Cure krill gel. 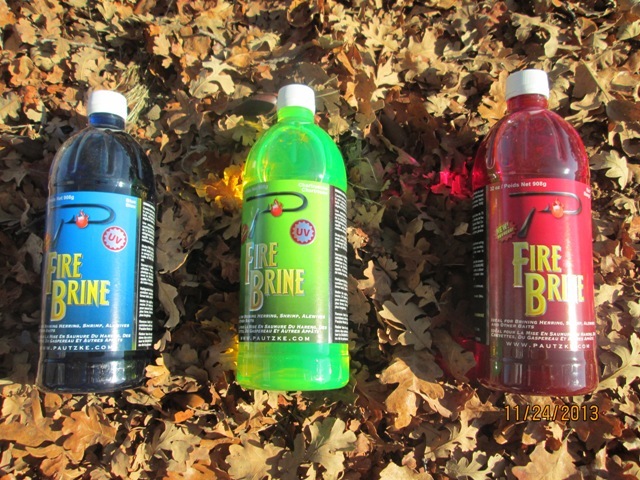 Red Fire Brine scented with Pro Cure garlic gel. As the water gets cooler and the winter months are approaching it is a good time to prepare bait for upcoming trips to the lake. 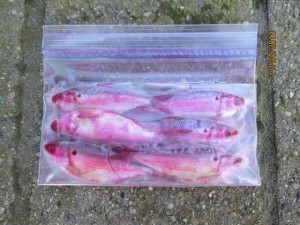 We will have regular frozen shad and pre dyed and scented shad in the freezer at the store. Try a few different colors and let us know which ones work best for you.